An evolution of allergy research. The EEU was originally located in Dupuis Hall. The Environmental Exposure Unit (EEU) is an advanced tool for evaluation of anti-allergic medications. Dr. James Day (MD) and Dr. Reg Clark (P Eng Chem at Queen’s University) began working on an allergen delivery system in 1981, an evolution based on this research collaboration for the investigation of the effects of urea formaldehyde foam insulation (UFFI) on the human respiratory system. Their original environmental chamber was an aluminum-framed polyethylene tent attached to a UFFI off-gas generator. In this system, air flowed from the generator into the tent where over 30 participants were seated and exited from the opposite side. 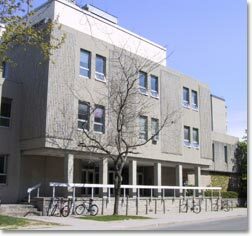 With the success of the original chamber and the realization that similar technology would be highly relevant for the study of allergic rhinitis, this led to the modification of a room at Queen’s University with a filtered air intake and exhaust system allowing for larger-scale studies involving up to 140 participants. The original delivery system was engineerd to handle ragweed pollen and included the development of a unique feeder system and computerized controls to deliver precise amounts of particulate to the controlled environment of the room. A specialized rotorod and laser particle counter system was developed to measure and ensure consistent levels of pollen were being circulated evenly throughout the room thereby assuring that each study participant received the same level of allergen exposure during the study. As more studies were conducted and the effectiveness of the EEU proven, the EEU was moved to a larger, specialized location within the Kingston General Hospital capable of accommodating up to 140 participant. While the EEU’s systems have been and continue to be refined, it was these innovators in Kingston that built upon the original controlled-exposure concept to make the EEU into the internationally recognized facility that it is today.